A rogue wave knocked me off my kayak and left me bobbing in the water. "No problem," I thought, as I snatched at the handle to pull the nose under the next wave. Before I could grab hold, another powerful wave roared up. 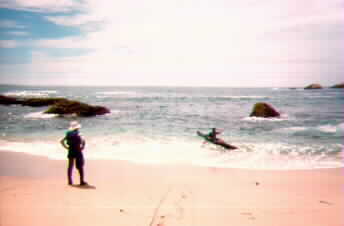 The kayak, caught low in the wave, was propelled toward the rock wall ahead, dragging me along. I let go. I've never seen that boat surf so well! It must have been going 30 miles per hour when suddenly, instead of slamming into the cliff, the kayak swerved to the left, then disappeared completely. My boat had been swallowed by a sea cave. 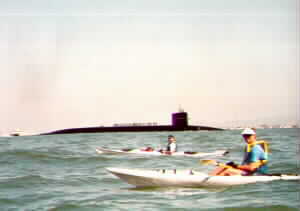 Tim Green, my partner (and expert kayaker), came to my rescue and immediately fell out of his cockpit boat. It quickly filled with water and became less wave- affected--unlike my buoyant sit-on-top. We swam the boat to the beach and emptied it. I swam back to the cave. It faced southwest, and the water was really rough inside. My life is worth more than a kayak; I gave up for the day. We headed back to the parking lot. Reaching my truck, I remembered that my keys were in the kayak. So I'dcall Triple-A. Oops, my wallet was in the boat, too--with the AAA card, $200 cash and all my credit cards! I finally got a locksmith out there, and I borrowed $90 from Tim to pay for the new key. Another friend loaned me enough for my hotel room that night. "Hi, honey, sorry to call so early, but I wanted to reach you before the Coast Guard did." I hated to wake my wife up so early on a Saturday, but imagine what she'd do if the Coast Guard found the kayak and called her first! Later that day, we made another attempt to recover the boat. The tide was lower, and I was able to enter the cave. It was as big as a house, and the water was fairly shallow. I boogie-boarded in far enough to see two smaller caves--known as tubes--leading from the main cave, deep into the rock. From the way the water streamed through them, I knew the tubes passed completely through the rock spit that housed the cave. I couldn't see the boat in either one. The waves continued to crash into the cave, making it dangerous to stay. Then the boogie board was torn from my grip and shot down the left-hand tube. This was one hungry sea cave! After reporting the loss to the Coast Guard and Park Service at Point Lobos, I returned home, planning to check out the possibilities of professional divers and salvage operations. Nearly two weeks later, I heard from the park service. Someone had spotted the boat and called the fire department. I drove down and picked it up next day. The wallet, money, credit cards, driver's license, keys, and most of the equipment I'd spent two weeks trying to replace were there, in better or worse shape. The kayak--well, it's a mess. Both ends are smashed upand there's a big split in one side. I'm glad I wasn't in it when it rushed into that cave.